SIM Ethiopia Theological Education Ministries seek to prepare church and ministry leaders, as well as cross-cultural workers. Leaders must be passionate about the gospel, think deeply about the Biblical story and shape churches through the gospel. We seek students who are spiritually, biblically, and practically equipped for disciple-making where Christ is least known and for planting and strengthening churches focused on discipling those who live and die without Christ. Seminary Teachers - Instructors for Bible, Theology, and Islam courses. 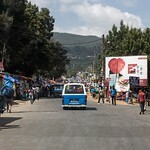 Pray for the Ethiopian leadership of programs in which SIM is partnering. Pray for the Lord to guide us into strategic partnerships which align with our vision and goals. Pray for God to reveal locations and initiatives where SIM can add value to work already launched under motivated Ethiopian leadership. Pray for God to reveal new areas where SIM theological education could make short and long-term impacts for reaching those who live and die without Christ with the Gospel.